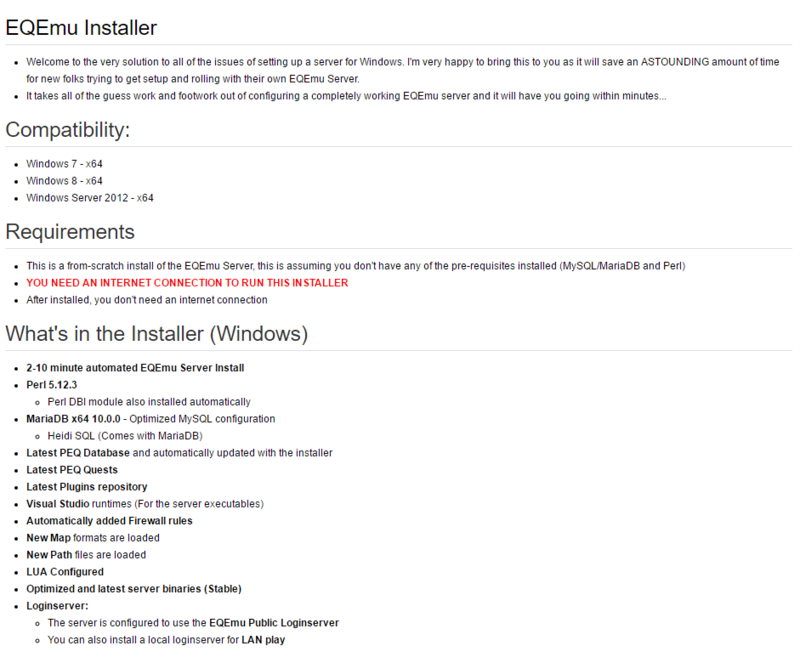 The purpose of this installer is to make the barrier to entry to setting up your own server extremely simple. It is amazing how we've been able to have a strong project like this for so long for people to be able to have their own sandbox and go wild with creativity or just enjoy a server for their own needs. Please note, that this is for clean installs of windows only. Enjoy - Please post if you have used this and share how easy it was for you. Last edited by Akkadius; 06-02-2016 at 01:17 PM.. Runs smooth as silk on a clean install of Win7 x64. Very, very cool. 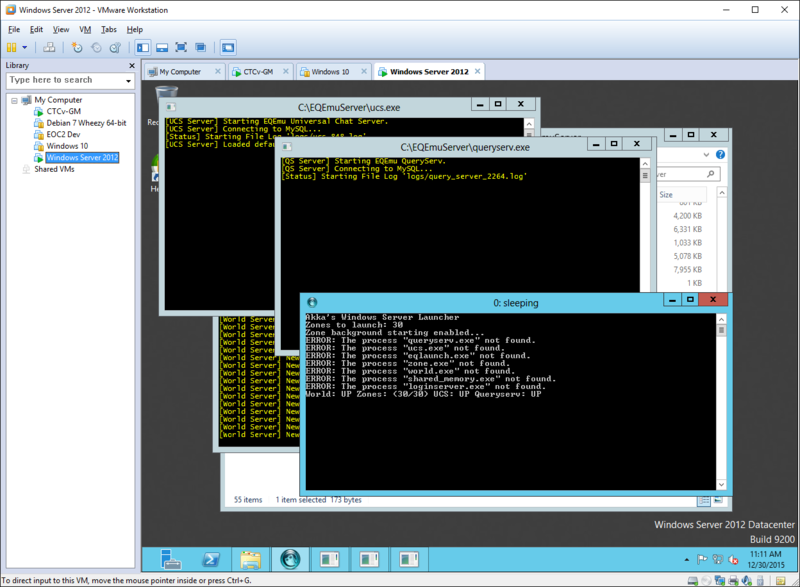 Just did it on a Windows Server 2012 R2 VM. Booted right up. Validated on 2012R2. The installer is pretty damn nice. Cleaned thread up. Let's keep getting tests in so I can make sure this is running clean for everyone. I installed it on a fresh VM running Windows 7 Pro 64bit with every available Windows Update installed. The main installation seems to have gone off without a hitch, but when I try to install the login server ( http://wiki.eqemulator.org/p?Akkas_P...server-windows ) I get stuck immediately after typing in 13. Part of the reason may be this: I don't know how to run the eqemu_update.pl file as an administrator. How do I do that? Shift+right click doesn't work. Edit: Before I forget, thank you for making this. It will be the closest I've come to having a working EverQuest server to run around with a couple of friends. Edit2: Okay, I ran it as administrator (command prompt as administrator, C:\Perl\bin>perl C:\EverQuestServer\eqemu_update.pl) and it seems to have worked after hitting enter at "Fetching Loginserver". I let it sit for 20 minutes previously and nothing happened, but that just may be a coincidence. I would say add the command prompt as admin to the wiki for people like me who are slow Also...if we are running a local login server, I assume we need to use t_start_server_with_login_server.bat to start up the server from that point forward? That would be correct, however I'll probably have the loginserver just install with everything else so there is no work involved other than just running the initial batch script. Normal install routine will simply install the loginserver along with it. I got a tiny lil' VirtualBox with WinXP totally clean. Looks like if you run it twice, it fails. And I didn't install WinXP 64bit.. is my real issue. I just noticed you exclude 32bit. Error 1017: Cannot login to the EverQuest server. You may need to re-run the Update Patch. Repeatedly seeing this message indicates a loss of connectivity to the Patch Server. This is usually temporary. Using the official log in server, I can connect and play as normal. I'm getting this same error. Everything seems to work great except one thing: Mobs don't drop loot. I've tried a few different clients (currently using RoF2, the newest build that seems to work), and while mobs will drop coin, they never drop items. Is this intended for this build, or did I miss a step? on one line instead of two, this is only esthetics though. for the Perl install step as well as the MariaDB install step? I'm sure you have a reason, I just haven't had enough coffee this morning to get it myself. 3. Why not do the Perl.rar as a self-extracting archive instead? Then you could completely skip the WinRAR install step.